So the solar project ended up taking a bit of an unexpected turn here. 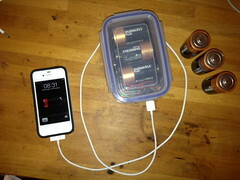 As you can see, the picture shows my iPhone being charged by a few D size regular batteries, with some electronics in a tupperware box all connected to a USB socket. To step back a bit, the solar project started with Patch and I unable to charge our various devices while at anchor for a few days earlier in the year. There were two main issues, firstly no mains power to run the chargers themselves, secondly no battery power to use for charging anything as the batteries were not holding their charge that well anyway. We have fixed the battery power issue, and have now installed a 12V - USB connector so we can charge gadgets. But the core issue of conserving battery power while at anchor remains, to some extent anyway. 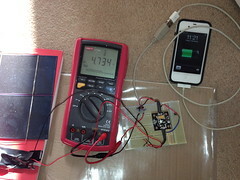 My thinking had been to create a solar panel that was capable of directly charging a device, such as a mobile phone, with no intermediate battery to charge. The solar chargers I've previously tried have been useless. I've made good progress with the solar powered charger already, as you have seen in a previous post. Anyway, the core issue at hand in crafting the solar charger had been to create a stable 5V for the USB socket from the solar panels I was making. My thinking being I could create less than 5V with the necessary amps easily enough in almost all reasonable light/cloud conditions and this could be 'pumped up' to 5V with some electronic wizardry. With some help from my mate Ian over at embedded adventures, he produced this little beauty which does the job perfectly (I deny any knowledge about carnivorous robots). I had originally used a handy array of batteries to test Ian's device. This got me to thinking that keeping a few batteries around, and using these in a stand-by gadget charger would work as well as, maybe even better than, the solar plan. The result, you can see, will probably be more useful than the solar panels I was planning, as D cells are ever present in all kinds of places I may need to charge my iPhone. While travelling for any time with no access to mains power comes to mind as a likely scenario where I could use this charger, especially when flying places. I still intend to make a solar version, as I have a few of Ian's gadgets left, but I can already see that making it sufficiently robust, yet portable, will be a challenge. We are still nestled in the marina at Beaulieu (Bucklers Hard actually), and are really enjoying the change from Southampton. Although it's not far, and even less as the crow flies, Beaulieu is a world away. 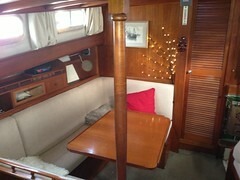 Just before coming round to Beaulieu we had the salon spruced up somewhat, with new curtains and covers done. This was done knowing we were going to be having a series of guests over to visit in the run up to Christmas, so it seemed the perfect time to get it done. The lights you can see lend a Christmassy feel to down below, this to augment the small flashing santa in the wheelhouse and a modest string of Christmas lights up the mast. Ours was the only boat in the place lit up with Christmas lights on Saturday night. I'm not sure if this is a good thing or not! Nevertheless, Arctic Rose does stand out at night now. The solar project has been rumbling on in the background. The main problem is that it's generally dark outside when I have time to work on the project, so that's not helping. Here is a picture taken during a chance sunny period, showing the cells are more than capable of charging my iPhone directly. All this is an initial prototype so, of course, looks a little messy. I'm planning a more robust version with wooden backing and properly soldered wiring etc. next. We've moved Arctic Rose round to Beaulieau, the plan being to spend December end early January there. So far, of all the places we have been, Beaulieau is probably our favourite. I know there is still a world out there to explore, but still, it's hard to stay away from the places we really enjoy. Here's a picture of Patch making the most of the far too comfortable lounge in the Master Builders Hotel, conveniently close to where Arctic Rose is alongside. The big fire is so much more appreciated as it's been a bit cold this last weekend. 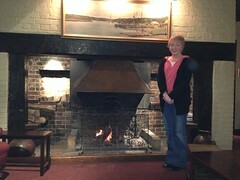 We were back in Cowes, IOW, this last weekend. This time by choice, rather than having been blown in by foul weather yet again. 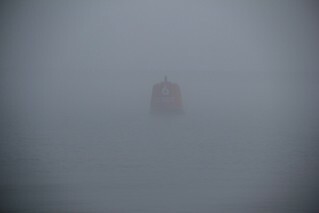 As usual I was up first thing in the morning, so got to enjoy the surreal foggy scenes around Arctic Rose. Spending a few days at anchor in the summer made me realise I needed some way of charging our gadgets without draining the boat's precious battery power. The solar panels I've bought before have been useless, so this time, I thought that if I made a panel up for myself, I may actually get what I want. I expect to leave a solar charger out in the sun and have whatever gadget simply charge up as if it's plugged into the mains or a usb port. This has never been the case with anything I've tried before. 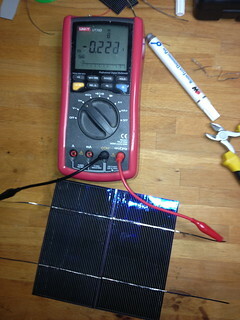 Now I'm working on building a solar panel which should produce at least the equivalent power of a USB socket. So far, I see I need sunlight or at least bright light to produce the power I need without getting silly about the size of the panel.